We've freshened up the cottage with some garden items just in time to welcome the end of spring and the beginning of summer. And we've got a truckload to bring in to the shop for you. Stay tuned for more pics of good old stuff. Next week Linda and I are going on the road to find lots and lots and lots more good old stuff to layer the cottage with. Who knows what we'll find? Everything looks so bright and summery. The little dream paintings are so cute. I love the brown pillow with the lace trim,too. Your entrance is looking very patriotic.  I love your blog - I'll be visiting Fairfax VA next Spring & would love to come find your cottage. Are you far from Fairfax? --forever wishing I lived back east somewhere (sigh). We're not far from Fairfax VA; about 30 minutes, I think. After coming all the way from Utah, it will seem a mere stone's throw! Thanks for your comment and we'll look forward to seeing you next Spring! DEEP BREATH, DEEP BREATH, DEEP BREATH.....Your shop gets my heartrate really going....LOL!! Love the little Happy Memories sign. We don't live close but can you buy it on your website? We'd be happy to ship something to you from our blog. If you'd like to do it through our on line store, we can arrange that. Otherwise you may call us directly and we can assist you over the phone. Thanks for your interest!